Until reading Sapiens, A Brief History of Humankind by Yuval Noah Harari, I didn’t realize the devastating adverse impact pre-industrial humans had on species diversity. Pre-industrial humans reduced (and continue to reduce) species diversity through hunting, agriculture, and protection of their domesticated animals. Thus for other life forms on Earth, simply reducing industrial impact is not sufficient. Other species are best protected in large land preserves free of any human development. Such preserves can be economically sustainable through eco-tourism. Prior to 45,000 years ago, there were no humans in Australia. Australia then had 24 "megafauna" animal species weighing 100 pounds or more. 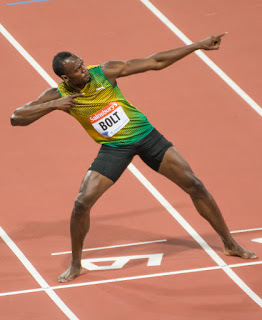 Very soon after humans arrived in Australia, 23 of those species and a number of other smaller species became extinct. This 90 per cent extinction of megafauna was more than coincidence. Nothing but the arrival of Sapiens explains such a sudden and extensive species loss. Sophisticated hunting strategies together with 'fire agriculture' – the burning of huge areas to improve hunting – radically changed vegetation and the viability of species. The circumstantial evidence for Sapiens’ guilt is compounded by being repeated innumerable times wherever the species arrived: within about two centuries of arriving in New Zealand 800 years ago, the Maoris had eliminated most megafauna and 60 per cent of all birds. Other scholars feel that natural climate change may also have contributed to species decline in Australia and North America. It is also true that a limited number of species benefit from human existence (e.g., sea gulls and garbage dumps). But it is hard to escape the logical consequences of our historical association with declining species diversity. Corroborating evidence can be found today in East Africa. In the eastern Serengeti, the pre-industrial, semi-nomadic Maasai people have virtually no “carbon footprint”: no electricity, no cars. Their herds of cattle, sheep and goats graze on native plants and they tend them on foot. They engage in very limited agriculture. Game preserves are contiguous to Maasai settlements. There are generally no fences or other boundaries between the preserves and the settlements. Within the preserves one finds abundant giraffes, elephants, lions, leopards, warthogs, zebra, ostrich, jackals, Thomson gazelle etc. Outside the preserves virtually none of those animals are visible. By simply protecting their cattle, sheep and goats from predators and allowing them to dominate grazing lands, the Maasai effectively displace a large number of other species. For this reason the Tanzanian government moved the Maasai out of the well known Ngorongoro Crater and their other National Parks. While restraining both humans’ carbon footprint and toxic waste are vitally important in order to help other species on Earth, the historical and modern record suggests that is not enough. Even if humans could somehow romantically return to a pre-industrial state, the shear number of humans and their need to be fed would still cause species declines. Good data on species diversity is hard to get. Mammal species diversity by country shows greater diversity near the equator. Countries near the equator also have a higher percentage of endangered mammal species. 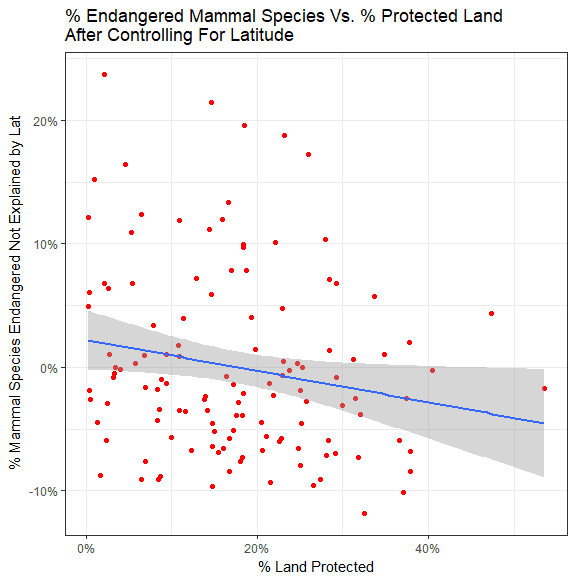 After controlling for the relationship with latitude, Figure 1 suggests the percentage of endangered mammal species decreases as the percentage of land area set aside to protect animals increases. In other words, simply keeping large tracts of land free from human development seems to be the best way to preserve species diversity. Many African and South American countries have effective “eco-tourism” models that make maintaining such preserves economically viable. As a plus, in many cases land in these preserves is not well suited for agriculture or other development. There is an art and balance even with eco-tourism to ensure it is being done well. In particular one needs to balance the economic benefit of increasing the number of visitors with the impact visitors have on wildlife and local culture. Transparent and reproducible: The R code used to produce all tables is available in “humanVsSpecies.r" on github.